Marco comments as follows: “I think that page represents the four seasons and shares the same orientation that we are considering for 69r: Spring at the top, with Summer, Autumn and Winter following counter-clock wise. I base this hypothesis on a few analogues. 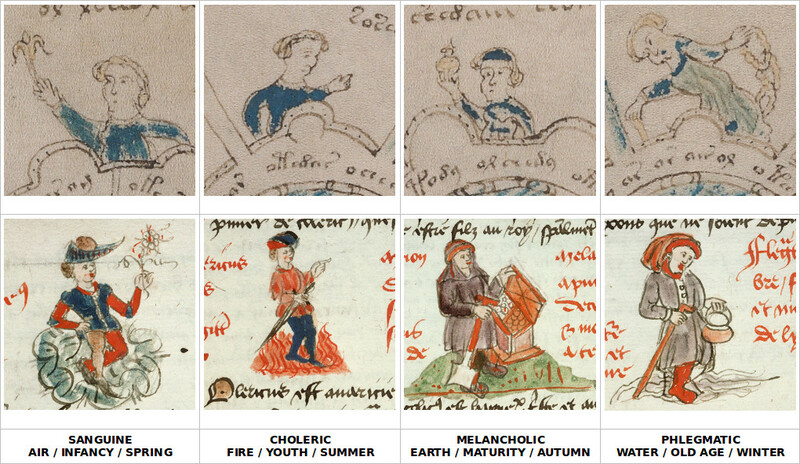 So I think that [in the Voynich image] the figure on the left in f82r2 (holding a spike) is Summer. The figure at the top is the most lightly dressed of all: I guess it is Springtime. Also note that Winter is the only one who is not bareheaded. Thanks a lot Marco – it looks very convincing to me. Any comments from anyone? Ceiling from Ferrara with the House of Este contains similarities. I often contemplate the similarities between this Voynich page and a Sumerian Plainisphere tablet (British Museum) from the King Ashurbanupal. 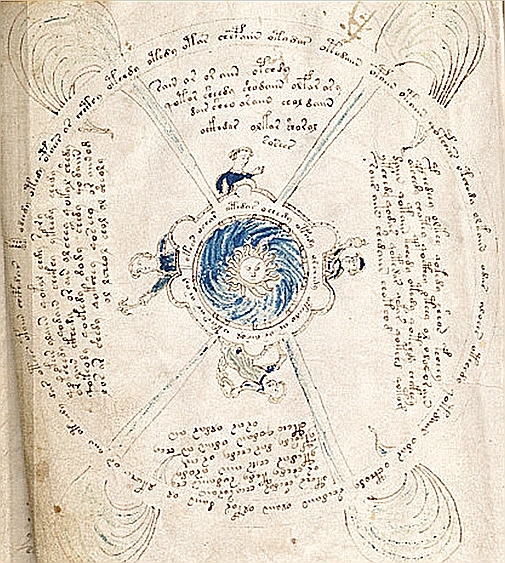 The tablet (which I will include in a following comment) has striking similarities to this Voynich page. Would appreciate any thoughts. from the image you attached, it seems you are discussing f68r3. I also guess you are referring to the neo-Assyrian circular tablet K.8538. The tablet has been interpreted as a representation of the sky at a specific time and place (the night of 3-4 January 650 BC over Nineveh). Several people have proposed similar interpretations for the Voynich diagram. See for instance what I wrote here or this more recent post by Stephen about a research by Andrés Eloy Martínez Rojas. Some ideas based on the hypothesis that the f85r2 diagram might represent the four seasons. I have here assumed that the four figures represent (clockwise from the left): Spring (with flower), Summer (pointing up to the Sun at its highest? ), Autumn (holding a globular water pot, representing rain, or a fruit), Winter (as an old man representing the aging year). I have considered the first word of the four paragraphs corresponding to the four figures, and searched for parallels, mainly on omniglot.com. So I went to the four seasons. Considering the left figure as the first one (Spring, in this interpretation) is also consistent with the start mark in the inner text circle, and the fact that the first word of the first paragraph (EVA:okees) also is the first word of the inner circle. Phonetic readings (in italics below) are based on Derek’s system (but I used ‘z’ for EVA:s -the ‘ts’ sound that Derek represents with ‘$’- and there could be other, hopefully minor, differences). Gagauz (a Turkic dialect mainly spoken in Moldova) possibly is the closest match. I also find the Sanskrit word interesting, because it derives from “flower”, in accordance with the illustration. I have here considered the hypothesis that also the second short word EVA:or could be part of the hypothetical season name, making it closer to the Armenian and various Saxon names (English included). The Sanskrit usma means both “summer” and “heat” and could be related to the Latin “ustus” (burnt). The word could resemble the Latin “autumnus” and its derivatives, but for the presence of the initial labial EVA:p. As Stephen wrote here, “some of the the famous ‘gallows’ characters’, in particular those transcribed in the EVA system as ‘p’ and ‘f’ do appear to act as initiating discourse markers, flagging up the start of sections. They are often decorated, which seems to add to the possibility that they are discourse ‘flags’ of some sort.”. So, it is possible that EVA:p here functions as a discourse marker and can be ignored for the phonetic reading of the word? Turkmen is a good match (the ‘y’ is not pronounced as a vowel), but for the lack of the initial vowel. Gagauz and Turkish are also similar. The combination of Gagauz and Occitan roughly covers all four words, but the two languages are obviously unrelated. Since Occitan is a Latin language, it is possible to imagine that some Turkic dialect similar to Gagauz also borrowed from Latin the words for Autumn (the origin of Summer might more easily be non-Latin). Maybe Orun Rubacı or some other researcher speaking Turkish could tell if there is any possible support for this wild speculation? Another difficulty is that Turkish has been mentioned many times in the linguistic research about plant names (see Derek’s summary table), but Stephen and Derek’s research does not seem to suggest a relation between Voynichese and Latin. you have a good point i think, kış is winter thats true, also gagauzes are a turkic clan and gagauz turkish is most similar one to turkey turkish in all turk clans. And more interesting is about occatian. i hear from many filologs that, if you listen a conversation in basq language, something would be acquaintance to you ( i suppose occatian is similar with basq language). In his discussion of f57v, Darren has mentioned the Persian Royal Stars and the association of the four archangels with the cardinal directions. I want to point out that personifications of the cardinal directions as Guardians of the directions are also present in Hinduism. They are mentioned in Vedic texts dating to the X Century BCE and before. The number, identity, appearance and attributes of these guardians (“Dikpalas” or “Lokapalas” in Sanskrit) are very variable. * The waterpot (“kamandalu”) is similar to the globular object of the figure at the right. The waterpot is an attribute of Agni (South-East), Soma (North) and Varuna (West). * The noose and the rosary are both similar to the “rope” of the figure at the bottom. The noose also appears in an eight-shaped variant (another example). It is an attribute of Varuna (West) and Yama (South). The rosary of Soma. * The staff (bottom figure) also is an attribute of Yama (South). * The lotus flower is an attribute of Indra (East). The trident (“trishula”) is also similar to the “flower” of the figure at the left. The trident is an attribute of Isana (North-East) and Siva (North-East / East). These deities were sometimes represented in a circular arrangement similar to what we see in f85r2 and f57v. In this case (Badami, 699), they are represented in the four corners of a square, around a central rayed circle that could be a solar symbol. 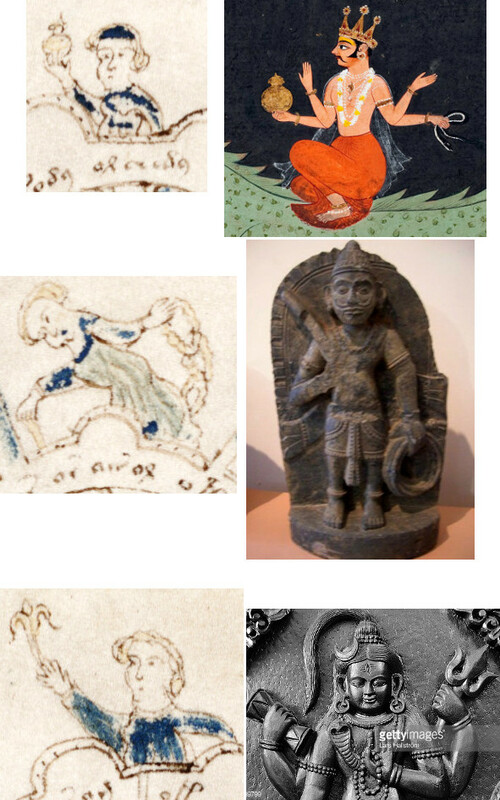 For more about the subject, see “The Gods of the Directions in Ancient India: Origin and Early Development in Art and Literature (until c. 1000 A.D.)” by Corinna Wessels-Mevissen. I hadn’t seen the ‘Voynichese.com’ link either. Great work to whoever did it. Perhaps it would be a good idea if the person who did it could give the official (Beinecke Library) foliation in addition to the informal one? Especially in a written paper, without its own illustrations, the disjunction would be annoying if the Beinecke site or some facsimile is being used as comparison. folio 85v-1 is simply not 86r-2. Personally, I see here, the 4 stands. from top clockwise. Science, needle Orb, craft baker with a pretzel, farmer with grain. Interestingly, the artist, the science of the nobility. I’m tempted – indeed I think I shall – make a post on my own blog listing texts which I think are obligatory reading before anyone sets out to interpret the sense of medieval imagery made between the 5th – 15th C AD. First among them, I think, would be Mary Carruther’s works, especially The Book of Memory and The Craft of Thought. Then the Psalter, with a number of the most respected marginal notes and commentaries. After that, perhaps, a comparative study of the liturgical calendars and of the emblemata attached to each of the days/saints. medieval imagery isn’t about the realistic representation of an *object*, but about the position that item holds in the web-and-hierarchy of accumulated significance that was understood as an accumulating insight into a world that was believed, without question, to be a consciously and rationally ordered thing, within a similarly ordered universe, that is both the visible phenomena and the invisible. So ‘East’ IS ‘Spring’ AND ‘Asia’ AND ‘the font of wisdom’ AND symbolic of resurrection etc. The sets of connection, and the worldview expressed by them, through the form given an image, are what usually (one would hope invariably) give us the who-where-when-and-why of the thing. ‘Lookalike’ matching is subjective and ultimately inconclusive. But there’s far more to reading imagery than playing at ‘matching pictures’. That’s why one should look first to explain aspects of the Voynich imagery which *do not* find counterparts in other western manucripts, nor in western medieval art in other media, and for which no explanation can be discovered in standard Latin writings. If something makes NO sense in those terms, then it probably doesn’t come from, or belong within, the historical and cultural context which is being assumed for it. Assuming the plant pictures in the Voynich will prove to be ones in the western herbal corpus, and then ignoring all the signs that say otherwise, is (imo) one of the reasons that after a century the written text is yet to be cracked. At least this folio under discussion – folio 85v-1 (= Voy.mailing list 85r2) does look to me very much European or Europeanised, unlike say the ‘bathy-‘ section which has scarcely any relationship to medieval Europe’s Latin culture. Its interesting that you note that in medieval imagery that “East” is “Asia”, as this is one of the conclusions from my analysis of the Rosettes T-O map continent names. East is synonymous with Sunrise and Asia. West is synonymous with Sunset and Europe. I like your comment about lack of similarity between the VM “bathing section” and European Latin imagery. I broadly agree, but there are some weak similarities with European iconography. This whole section, I believe, is related to the concept of medical astrology. This is a topic I’ve been thinking about for a while now. I’ll post a short paper on this topic soon explaining my ideas in more detail. Well, Asia is by convention called the East, and shown so even in the T-O diagrams, though early medieval maps so get a bit muddled over details. “west” tended to be a nebulous sort of description, but by natural opposition was placed about Gibraltar or more exactly the pillars of Hercules. About the bathy- section I differ from you. I see no reason why the ‘nymphs’ should be read as personifications [of stars] in the astronomical section and any more literally in that one. There’s only one figure I think certainly portrait-like in the whole ms. and that’s within the North emblem for folio 67v-1 (foliation as per the Beinecke Library site). In fact I see those figures as derived again from a play on a term homophonous with the Greek ‘oura. But I explained all that about three years ago and won’t bore everyone by repeating it. 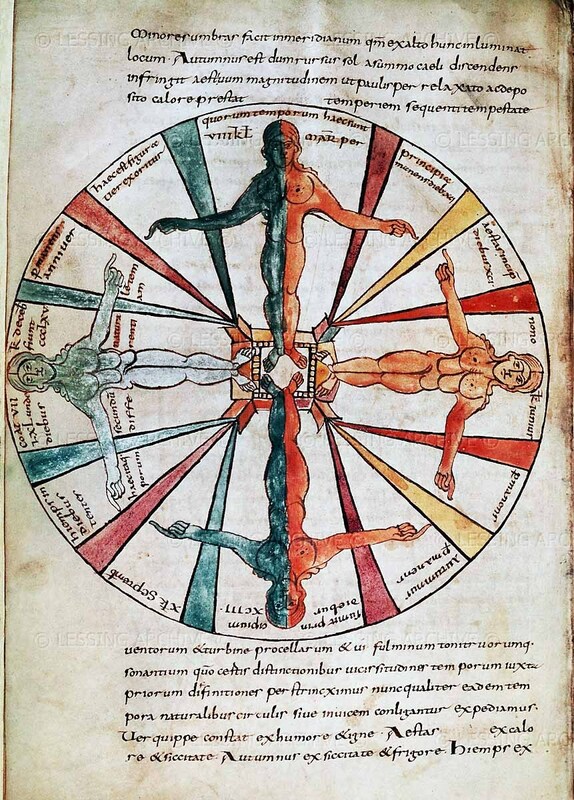 The notion of it being related to medical astrology will probably draw a lot of interest, since a fair number of people have suggested the same over the years, but more as the astro- side of medicine than the medical side of astrology I think. Thanks Diane. I appreciate your comments. I’ve addressed some of your points about angel/stars in my post below. I notice that Derek is starting to find Greek star names in his study of the VM star charts, and I previously identified some Greek-related text on f57v. To expand on Diane’s point about “lookalike matching”, discussed above, this ultimately assumes that there other extant images to compare with. I’ve been thinking if there is another historical artefact that is analogous to the VM and the best think I can think of is the Antikythera mechanism. This really does seem to be another one-off with no other comparable examples. Prior to its discovery in 1900 , whoever would have thought that the ancient Greeks could have developed an analog computer? I think there are further parallels, in that it has also taken 100+ years to fully understand its function and purpose, a significant difficulty being that their are no other surviving examples to compare it with. Like the Antikythera mechanism the VM may also be a one-off surviving example, I don’t think the language of the VM is a “language isolate” but the illustrations and paintings within seem to be unique. 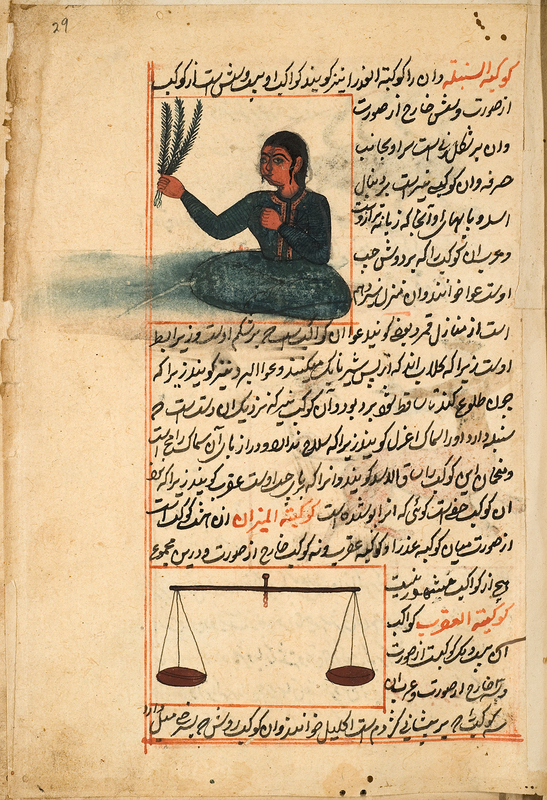 Its been noted else where that the VM seems to have a Persian origin – does anyone know if there is a Persian religious movement (or religious figure) that was known to create religious texts containing paintings and illustrations? Perhaps also using a unique script for their writings? The depiction of paintings and illustrations is what seems to differentiate the VM from other extant manuscripts. It’s a fourfold system alright. Any ideas or historically attested parallel for the four billowing banners in the background? Are they the wind’s gateways, do you think? And since this is so structured a drawing, can anyone identify the text(s) from which it has been derived (as almost all medieval imagery is derived). Many thanks. If foliations are to be given which differ from the normal practice – ie following that of the library which holds the manuscript, then could the Library foliation be at least referenced first, with any other private system following in brackets – such as (Mailing list folio…. ; Jason Davies folio….). For enthusiasts in private conversation, some non-standard method is fine, but someone from the wider public, or a busy academic reasonably expects folio 85v-1 to BE folio 85v-1, and if they can then be bothered hunting through the Beinecke scans to follow a discussion, only to find *no such folio* as 85r-2 … well, it’s all a bit precious, in-house and time-wasting, don’t you think? Does one absolutely *have* to join a mailing list, or read some particular researcher’s website, or buy the manual to be able to follow a public discussion? Nick Pelling mentions Marco’s ideas but dismisses them rather rudely without any discussion. Not polite, but I’m sorry to say it is a bit typical. His own suggestion is completely inconclusive. In my view Marco’s ideas are very strong, especially with the evidence from other manuscripts and items. I agree that this page is pretty certainly representing the four seasons. Thank you for linking Nick’s post, Alan! I found Diane’s comment about “the barsom of Zoroastrianism” as a possible interpretation of some of the features of f86v4 very interesting. Nick’s analysis of the couple f85r2 and f86v4 can certainly be useful: I am looking forward to see manuscript illustrations paralleling this couple! 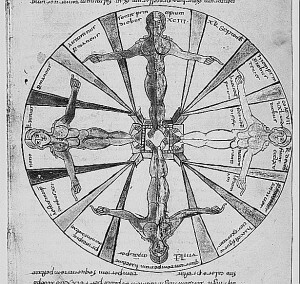 In the meantime, the analysis of f85r2 proposed by D’Imperio (p.18) seem to me the better interpretation available: ”This drawing seems likely to be related to the four seasons, the four ages of man, the four humors, etc.”. The analysis I proposed only adds a few similar illustrations (with four human figures radially disposed around a circle) and the tentative identification of some of the attributes of the four figures. 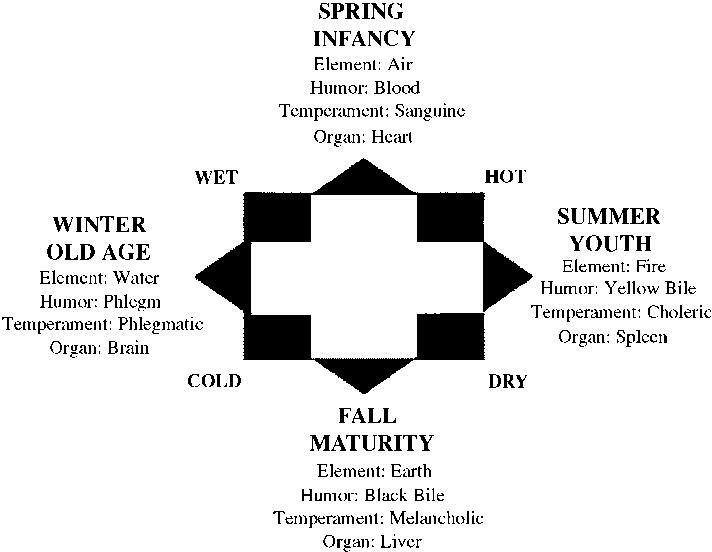 Of the possible interpretations mentioned by D’Imperio, the four seasons are in my opinion the most compatible with the central Sun (representing “annus”, the year). For the record, I agree with you! So… if you’re convinced that this “sun”-page represents the four seasons, what does the “moon”-page immediately next to it represent? What I was trying to point out was that the Voynich Manuscript has many such deeper symmetries, and that we should be looking for parallels for those deeper symmetries in existing documents, rather than clutching at superficial similarities that prove almost nothing. I am not “convinced” of anything. In my hobby of ancient iconography, I try not to follow any kind of faith or absolute belief: I just look for parallels and go for what seems closer to the image I am observing and more coherent with the discernible context. The four seasons are the best explanation of f85v2 I know of, but I will not be surprised if better visual parallels will be found in the future, or if the translation of the text will reveal a different meaning. As pointed out by D’Imperio, this subject is closely related to the Four Seasons, and often conflated with it. Moreover, plants and flowers (see the figure on the left) conventionally represent Youth as well as Spring. I consider the Four Ages of Man to be another reasonable candidate. I prefer the Four Seasons because the Sun at the center suggests to me a cosmological meaning, more than an allegory of human life. 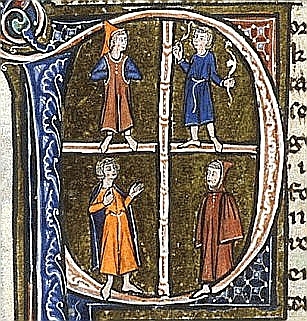 Tractatus de Quaternario, c. 1100. Cambridge, Gonville & Caius College, MS 428. This interpretation has the advantage of explaining “the four billowing banners in the background” mentioned by Diane. But, again, the Voynich diagram seems to me to be related to the macrocosm, because the Sun appears at the center: I think the subject must be closely related to the Sun. Understandably, in the parallel proposed by D’Imperio, Man is at the center. Since I know of no visual example, I cannot formulate an opinion on this idea. The meaning of the Sun in this case is not clear to me. 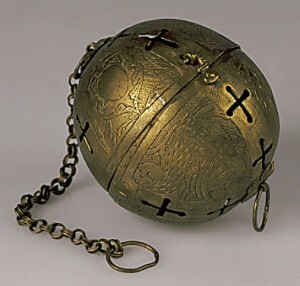 As the name suggests, this kind of allegory typically include a wooden wheel (with discernible wooden spikes and a handle for turning it) and an allegory of Fortune (typically represented as a crowned and/or blindfolded woman). Here none of these two elements is visible. The characters rising and falling on the wheel of Fortune are represented as lying on its circumference, in order to make the rising/falling movement clearer, while here the four characters are perpendicular to the circumference. In this example, the seasons are represented as four persons standing around a circle, perpendicularly to its circumference, as in the Voynich illustration; flowers appear as Spring’s attributes. The golden circle at the center likely represents the Sun. 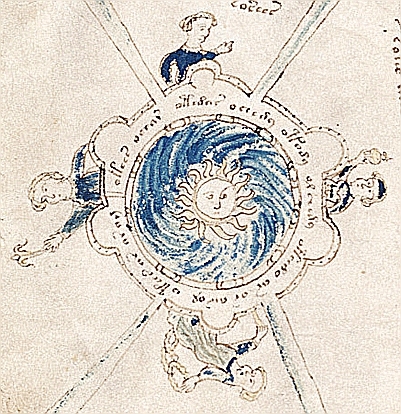 In this case, the overall organization of the diagram is different, but Spring (“ver”, top left) holds two branches; the Sun and the Moon appear at the center of the illustration, which also includes other cosmological elements that we find in the cosmological section of the Voynich manuscript (e.g. the Zodiac). This subject seems to me coherent with the cosmological context and with some of the details of the Voynich illustration. So I currently prefer it to the other candidates. * Alfonso X “Tratado de astrologia y magia” (Biblioteca Apostolica Vaticana. Reg. Lat. 1283) and Lapidario. I think Rene Zandbergen has been the first to point out the relevance of Reg Lat 1283 as a parallel for the Zodiac pages f70v ff. * f68r1 / f68r2 as maps of the Northern and Southern skies, as discussed on this site (but manuscript parallels, e.g. 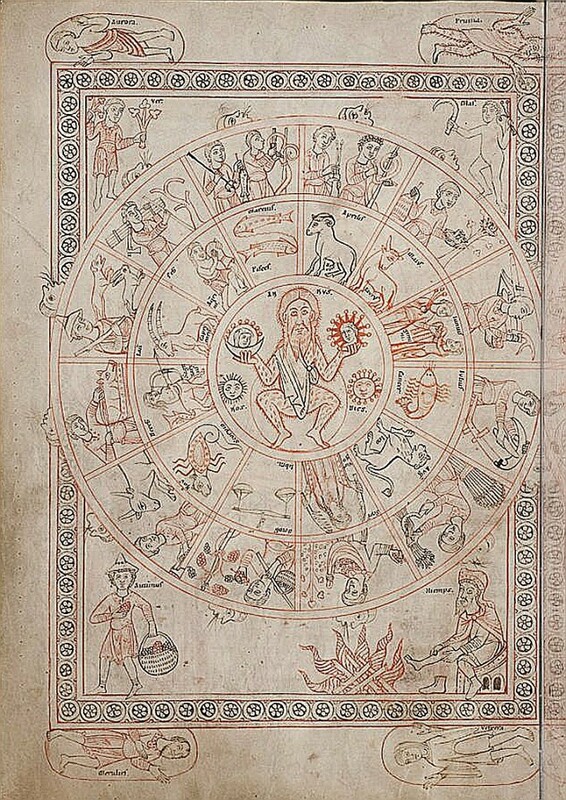 MS 5415Oesterreichishe Nationalbibliothek Wien, always include images of the constellations). Nick, we need to do BOTH…. look at each page and try to work out what is going on, and also try to see the wider pattern. One without the other is pointless. After Nick removed the cruft from the lunar image it looks ver much like an rendition of the lunar phases. If that’s the case the opposite panel may be the equinox and solstice…interpretations that lend further credence to the 4 seasons interpretation. Marco – I like the fact that you have multiple ideas on the possible purpose of this page. I have another different idea too! 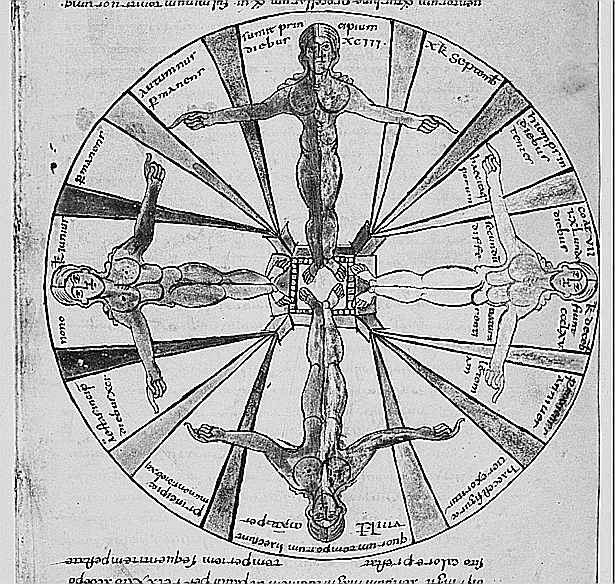 My suggestion for the four-fold system described on f85r2 is that its a Gnostic cosmological diagram describing the Mysteries of Creation, so I agree with your suggestion that this page has a cosmological function. “A great angel, the enlightened divine Self-Generated, emerged from the cloud. Because of him, four other angels came into being from another cloud, and they became attendants for the angelic Self-Generated. The Self-Generated said, ‘Let […] come into being […],’ and it came into being […]. And he [created] the first luminary to reign over him. He said, ‘Let angels come into being to serve [him],’ and myriads without number came into being. He said, ‘[Let] an enlightened aeon come into being,’ and he came into being. He created the second luminary [to] reign over him, together with myriads of angels without number, to offer service. That is how he created the rest of the enlightened aeons. He made them reign over them, and he created for them myriads of angels without number, to assist them. I think the central sun could be a reference to the “luminous cloud” and the four figures are the “four other angels” mentioned in the passage. I’m not sure who all the four angels might be. Gabriel and Michael possibly are depicted but I’m not certain who else. The “myriads of angels” mentioned could be a reference to the other angel/nymphs that appear throughout the VM zodiacal and bathing section. Does anyone know if there is a gnostic manuscript containing a graphical illustration of this concept? Furthermore, here is a quote from as passage in “The Lost Gospel of Judas Iscariot (A New Look at Betrayer and Betrayed)” by Bart D. Ehrman p.93. (I think the parallels with the VM are easy to perceive). This book is a study of the Roman Era Gnostic text “The Gospel of Judas” that was written in approx. 200 CE. […] everyone has a guiding angel and each angel in connected with a star. The stars in the sky are in fact angelic beings, any each of these beings has oversight of a person on Earth, being connected to a person’s soul. Just as we talk about “our guiding light” so ancient people – especially those influenced by the Greek philosopher Plato, as were the Gnostics – could speak about their guiding star. I think this explains why so many of the angel/nymphs on the zodiacal pages seem to be holding tethered stars. They are holding their “guiding light” and each angel represents a star. What do you think about this interpretation? Other gnostic groups have similar creation myths; the Mandaeans have multiple creation myths (upto 6, I recall) and there are parallels with the one described above. The Greek philosopher and mathematician Plato (428 BCE – 347 BCE) seems to be the origin of this concept linking angels and stars, which is described in his work “Timaeus”. Quote : In Timaeus, the human being is one of the three classes of mortal beings created partially by the gods (which were created by the dêmiourgos and are visible—the stars and planets—and invisible) and partially by the dêmiourgos. The body, which is mortal, was created by the gods (cf. 42e-43a), whereas the soul was placed in the body directly by God; the soul is called the guiding principle and the divine part (41b-d). Individual souls are made out of the same stuff as the world soul, although it is explained that this stuff was not as pure as before (41d). Each soul was assigned a star (41d); if a person lived well, upon the death of the body the soul would return and dwell in his home star; if not, then the soul would be reincarnated (42a-c). There does seem to be considerable Greek influence in the VM. For example, the first two plants in the “herbal section” have direct links with Heracles, the Greek mythological hero. I guess the four angels could be the four archangels, usually named Michael, Gabriel, Raphael and Uriel. With reference to f85r2, I think that the fact the figures are not winged is not suggestive of angels in general and nor of archangels in particular. 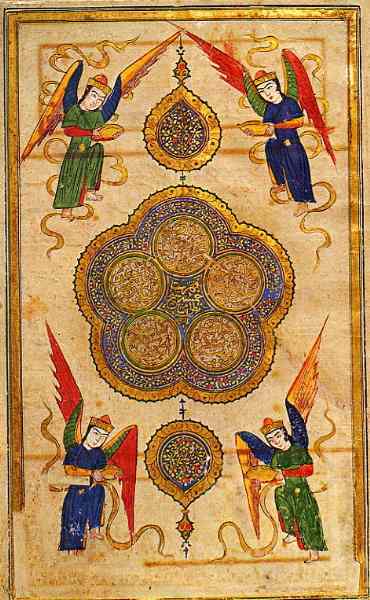 I could find illustrations of four angels around a circular center, but they usually seem to be supporting the circle or flying around it, not to stand on it. Mine was too: but I didn’t like where that led. the image on page next to f85r2, although it does have a moon in the centre, is NOTHING like the one which Marco is discussing. It is clearly NOT intended to be a parallel representation to page f85r2, so your question becomes irrelevant. If the two images were alike – for example in being divided into four segments, both with human figures, with the distinctive blue swirls and and so on, then we could suspect that the two were related, and an explanation of one should also take account of the other. But here there are so few resemblances that it is likely that each represents an unconnected aspect of cosmology. I agree with your overall point, that it is useful to try to see patterns across in the manuscript as a whole, but NOT with your point that – in this case – Marco’s interpretation should somehow also explain an image which has no resemblances with the one in question. So – sorry to disagree – Marco’s interpretation stands up well without any need to allude to the moon illustration on the next page. I think these two images may have a common ground after all (together with a lot of other images in the Voynich manuscript too). I suggest for f85r2 an illustration for Dante’s paradiso 2nd Heaven Mercury, and for the one right next to it (f86r4) Dante’s paradiso 1st heaven moon. Not to bore people who are not interested with all the details, I just put these things together in a paper (link underneath), that includes a two page summary of what I suggest. I suggest that (basically) the complete Part III of the Divine Comedy is in form of illustrations and images in the Voynich Manuscript. 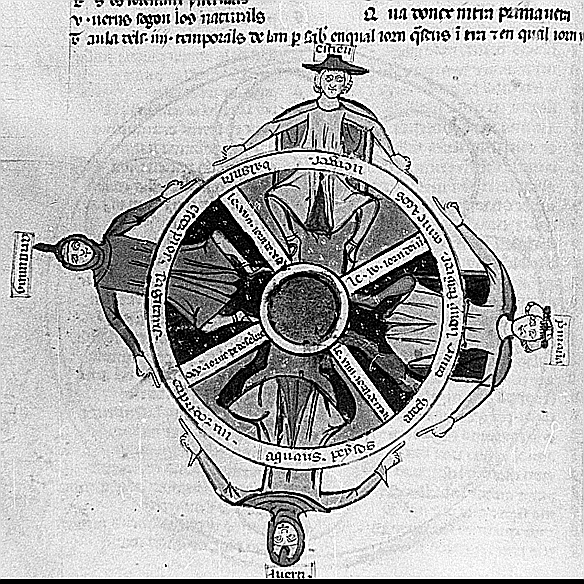 I also suggest other heavens ( Mars, Sun, Jupiter, Saturn, – all based on imagery) and the golden ladder for the ascent of Dante to the Fixed Stars. Finally I believe to have associated f67v with the Primum Mobile ( the folio with the coloured TO map) -identified by names and the image- if this turns out to be true, there may be some more angles to look at text in combination with the stars (that well may be names of souls or saints). Juergen – As you probably know, you’re not the first Voynich researcher to report on similarities with Dante’s Inferno. A guy called Ernest A. Lillie has also written a long paper on this hypothesis. Its one of the most creative theories that I’ve come across, and I think there is an element of truth in this idea. I believe that what you have noticed is the Gnostic influence in the VM. (If you google on Dante and Gnostic, you’ll find a lot of material). The second ideas is that Dante was a Patarene in his youth. This is the name given to the Italian sect of the Bogomils or Cathars. Although your theory explains some features of the VM, I think the most plausible explanation is that both the VM and Dante’s Inferno have been influenced by Gnostic theology. I don’t think there is evidence (yet) to suggest that the VM is a Patarene manuscript, however, I think there is good evidence to suggest the VM *is* a Gnostic text. Darren, thanks for your comments. I didn’t know about the gnostic aspects re Dante’s inferno. Food for thought. I was aware of other links and, obviously, the Lillie paper ( see the text of my paper and the quote). The point was that Lillie refers to Part I and II ( inferno and purgatory) whereas I refer to part III (Paradiso) in the images – so a different angle. Lillie links Paradiso solely and exclusively to the Rosette Map. I suggest the other folios to be illustrations of Paradiso. May I ask that when you mention Dante’s inferno, you mean Part I of the Divine Comedy only? Or all three Parts including Paradiso that I use for my suggestions? Juergen – If Dante was exposed to gnostic teachings, as a Patarene (Bogomil), then it seems plausible that this would inform all of his writings. However, the “Dante hypothesis” only seems to explain some pages in the VM, and until the text is translated, I will remain unconvinced there a direct link with Dante. What seems more likely is that the writers of both texts have been influenced by gnostic ideas. just to reiterate that my suggestions are based on the comparison of the imagery (a combination of a number of images to be precise) – if the text is related to the images then I believe there are some new potential entries. I never intended to explain the entire VM – Do you believe that the entire text is one story? I could imagine a theme, let’s say I somehow favour ‘paradise’ (also in a literal sense of garden) but don’t think there is one cohesive story/text. It seems to have been mis-labelled and incorrectly indexed; the title and author on archive.org is given incorrectly, but it is the right book. ref ROS Page Is it a guide for planting ?within the center circle it has 13 blue shapes is this a reference to 13 moon cycle’s ? 1. in the center of circle The Messiah, because in the medieval times artists decipted him as the sun. 2.on the left there is Gabriel with a “lily” at his hand. im not sure about other, they may be Michael, Raphael, and Uriel. Or 4 of them might be Gabriel’s four different variation. on the right he has a latern on his right hand and latern is Gabriel’s object too. Orun – how interesting you should mention this. You might enjoy my recent posts where I’ve said much the same, taking the Sawley map as one of my comparisons. Do You know our job about comparison and analysis between the Voynich Manuscript and Castel del Monte Emperor Frederick II? I ask to Stephen Bax an e-mail address to send the pdf of our study. Thank you and I look forward. I believe the concept behind this illustration is an outline map of someones voyage that attempts to record both time and place. The southern figure is holding an Egyptian offering in the form of a gold chain indicating an original African origin. There are also other illustrations in the VM that point to Africa. The figure holding the symbol of the Fleur-de-lis could indicate France; (the three petals represent the three medieval social classes) and the double bubble beside the figure could mean it includes Spain. The northern figure could be Britain and the eastern could indicate Italy and? Note that while there are 4 figures; north and south have 1 bubble and east and west have 2 bubbles. There are also other illustrations in the VM that point to Africa that are the oldest, most ancient concepts that I have ever seen which is exactly what makes this manuscript so exciting. If the ‘two bubbles’ are significant, perhaps they refer to the way that – in terms of natural observation – sunrise and sunset each have two limits on the horizon, while the points of north and south remain fixed. But the ‘bubbles’ could be just decorative, couldn’t they?. Thanks John. The problem with plant identifications is that it can be a very tricky business See this posting for a full discussion. Green and blue water is also common in other parts of the world. So personally I prefer to search nearer to Europe, although the language itself could come from further afield. I would like to about an observation of mine reguarding 9v and 19r. First, the leaves lack the distinctive rounded, heart-shaped look of violet leaves. Rather, it has bunches of longer, oblong leaves. Moreover, the petals lack the dark markings that almost always appear on violet petals. In adition, the first word – likely the name of the plant – on 9v is “fochor”. The first word on 19r is “fchor”. Considering that the script likely uses some elements of abjad, these could easily be the same word. At the very least, similar words. 19r is usually described as Greek Valarian, but 9v resembles it more. But with the similar names, though, I find it likely that 19r is a related flower, probably also of the Polemonium family. Thanks for these ideas – intriguing. I’ll make a special page for 9v and 19r and put your suggestion there. thank you very much for the new page, and many thanks to Daniel for his comment! It is from a 1100 ca Manuscript title “Tractatus de Quaternario” (Essay about the quaternary) – Caius College, Cambridge, MS 428. D’Imperio says that F85R2 “seems likely to be related to the four seasons, the four ages of man, the four humors etc… Figures of this sort are very common in medieval astrological and medical manuscripts, and refer to the central doctrine of the ‘microcosm’ or ‘small world’ of the human being, thought to reflect or recapitulate in miniature the elements and relations of the larger universe of ‘macrocosm’”. Do you not see that the year displays four aspects, passing through them, in a semblance of our life? For spring, in its new life, is tender and sap-filled, and like a child: then the shoots are fresh and growing, delicate, without substance, quickening the farmer’s hopes. Then everything blossoms, the kindly land is a riot of brightly coloured flowers, but the leaves are still not strong. From spring, the year, grown stronger, moves to summer, and becomes a powerful man: no season is sturdier, or more expansive, than this, or shines more richly. Autumn comes, when the ardour of youth has gone, ripe and mellow, between youth and age, a scattering of grey on its forehead. Then trembling winter, with faltering steps, its hair despoiled, or, what it has, turned white. 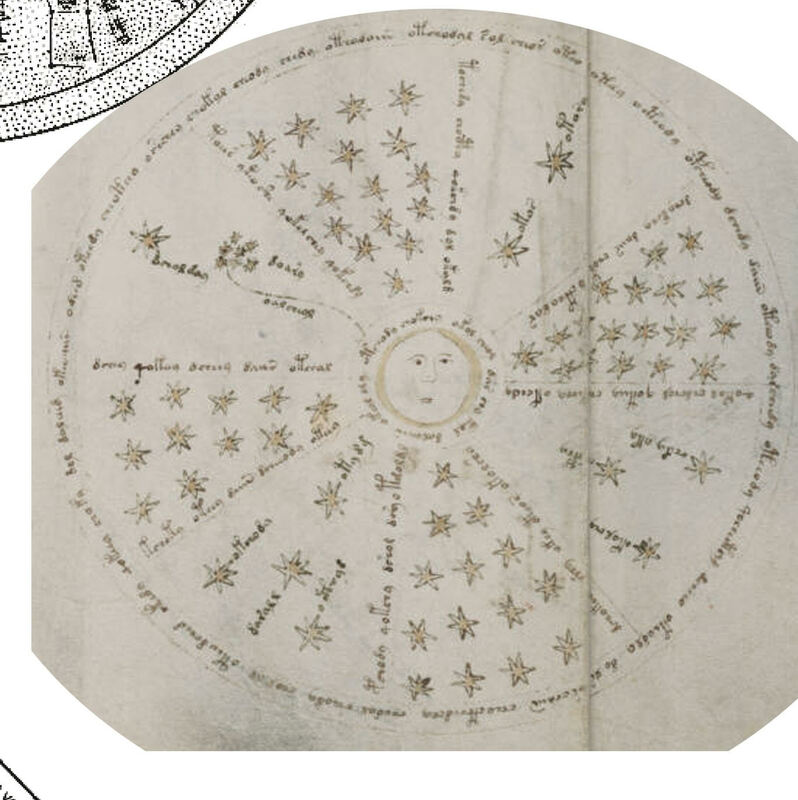 In my opinion, the fact that the Cambridge manuscript has a human figure at the center, while the Voynich diagram has the Sun, suggests that the Voynich diagram is related to the Macrocosm, i.e. to the four seasons, more than to the human Microcosm and the Ages of Man. Both Senectus (Old Age) and Decrepitas (Decrepitude) are represented by spinning women (supporting Daniel’s interpretation of the lower figure in f85r, even if I cannot clearly see a distaff). I am still puzzled by the lower figure. It would be nice to find a better fitting analogue for it! I must say that also the hand-warmer interpretation for the spherical object held by the figure on the right should be better documented, but I have been unable to find any specific example. Thanks Marco, fascinating as always. Your ideas about the text are particularly interesting and will keep me busy for days! Is the Voynich text from around the rim of the circle? Excellent, Marco and Stephen (and thanks for the April lecture, Stephen). As I hinted in my March comment on the Mexican theory page, I’m convinced that deliberately selected poetry from iconographically similar manuscripts will be the key to unlocking longer passages. It is much more likely that most of the texts are translated works standard to the time than original compositions by the VM scribes. It would not surprise me at all if Isidore were represented. Dioscorides, Matthaeus Platearius, etc. I may start working backwards from known texts towards similar groupings like Marco’s suggestion above. I am glad you find the idea interesting! Many words of the text in the outer circle of f85r2 end in EVA “dy”, read possibly as DN. Comparing them to St. Isidore´s text in the 9th Century illustration, I ask if EVA “dy” could mean “day”. I have found “day” translated in other languages as DaN (bosnian, croatian, slovenian, serbian), DeN (bulgarian, slovak, macedonian, russian, czech, ukrainian), DieNa (latvian, lithuanian), DiNa (bengali, hindi, nepalese, punjabi) and DzieN (belarusian, polish), among others. They seem to contain the same consonants. Yes, I know! Maybe “dy” is a common suffix of the underlying language in most cases. I tried to figure another possibility from the context. thank you for linking http://www.voynichese.com/ ! I was not aware of the existence of this amazing online tool! It could be a woman spinning with a distaff, but then sheep are normally sheared in spring, not autumn.